To be fair, this should be "triathlon 100" because, unlike running, I have been training for and competing in triathlons only for a year now. 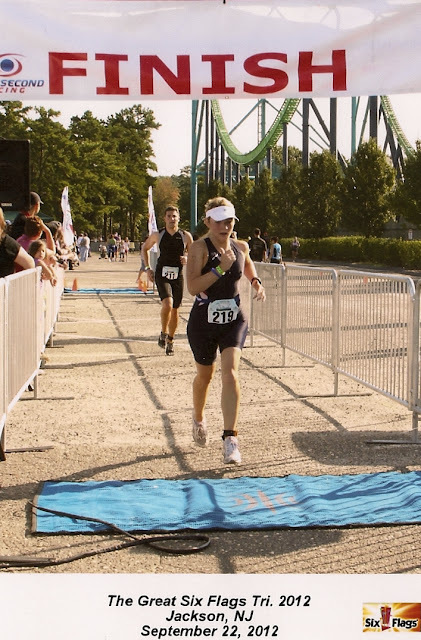 I did four triathlons last year: three were "sprint" (and one of those sprint tris was actually a duathlon because the water quality was, um, questionable so the race organizers dropped the swim) and one was an olympic distance. I am hooked on tris - this year I have a more aggressive race plan: an "olympic plus" distance in my home town in May and a half-ironman in September, with a handful of sprints peppered throughout the season. Here is a primer in case you are tri-curious. Wheeee! 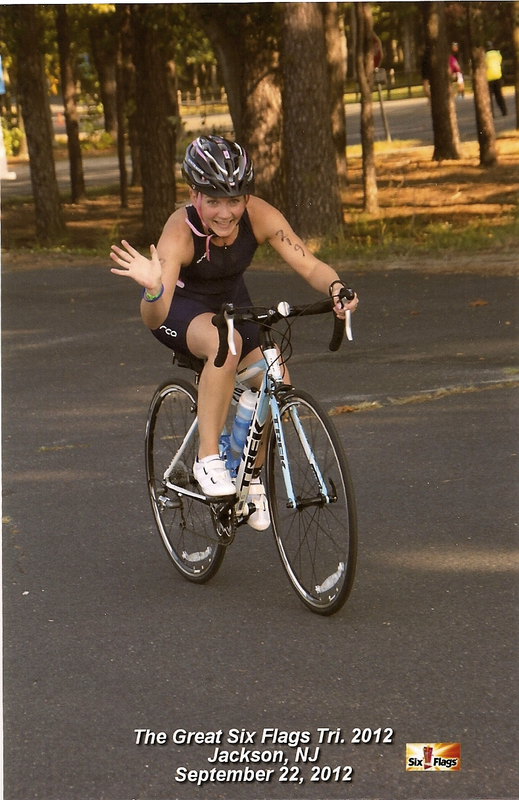 Triathlons are fun! Sprint - the sprint distance is the shortest. It usually involves a .3-.5 mile swim, a 12-15 mile bike, and a 5k (3.1 mile) run. 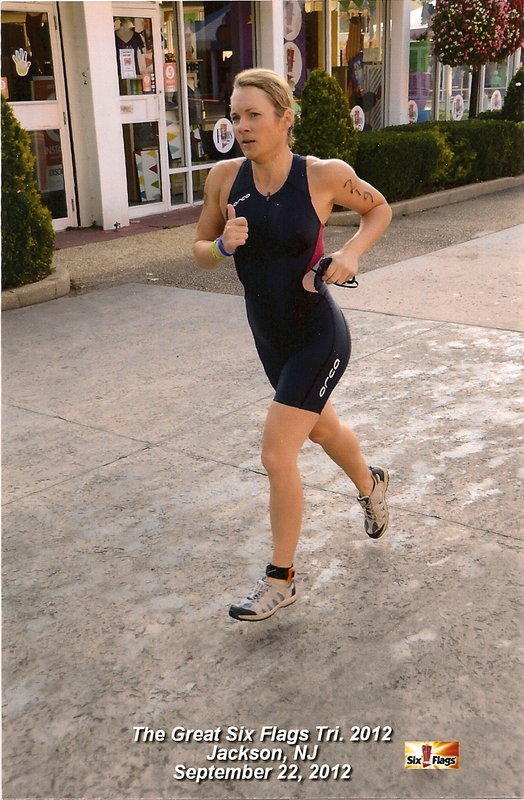 Olympic - olympic distance involves .5-.7 mile swim, 25-40 mile bike, and a 10k (6.2 mile) run. Half ironman - ok, this is no joke. This race has a 1.2 mile swim, 56 mile bike and a half marathon (13.1 mile) run. Ever see 70.3 stickers on people's cars? That means they have done a half ironman, because it is a total of 70.3 miles. Ironman - double the distances of a half-ironman: 2.4 mile swim, 112 mile bike, and a full marathon (26.2 mile) run. Yes: the race ends with a marathon. Cray-zee-town. I love the American Triathlon Calender website. It is, I think, a comprehensive calendar of races throughout the country with all distances. Word of mouth is good too - chances are you know someone who does triathlons. Also, check out local YMCA websites. Most Ys, at least in my area, have a sprint distance triathlon with a pool swim (which is a great way to get your feet wet on tris, so to speak). It goes without saying, but you have to know how to swim to compete. You also need access to a pool, or better yet, a lake, in which to train. I have swum all my life (not competitively) and am very comfortable swimming laps and even swimming in lakes. But oh ... swimming competitively in open water is a different animal. It can be scary. I have done it twice (the other tri had a pool swim, which was great) and both times, I was a little panicky. I was not afraid of people swimming on top of me or drowning - it wasn't like that. I knew there are tons of kayaks nearby for the sole purpose of helping distressed swimmers. It is the vastness of the water - the openness - that is kind of freaky. As with most races, it's a mental hurdle. I was not prepared for this, so I share it with you. I know I need to practice more in open water, which is not always easy to find! 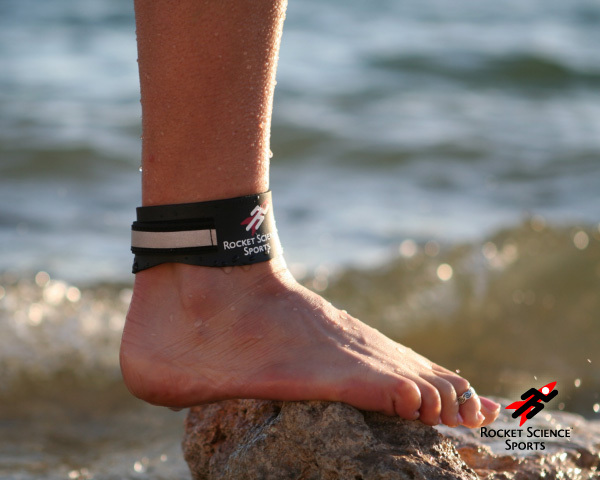 It is a great item, because you wear it through all three events: you swim in it, bike in it and run in it. and do not have to change a thing in between legs of the race. It's fast-drying, form-fitting and has a little bit of padding on the bum but not so much that you're uncomfortable during the run. There are separates as well, but I prefer the single suit. You will see both men and women wearing these during the race. Bike gear is the most complex and the most expensive. I confess that the bike is my least favorite part of the race. For your first triathlon, all you need is a bike and a helmet. Helmets are helmets, and there is not much difference among them. Races will absolutely not let you compete without a helmet, so it is a must. As for the bike, there are a couple of options: (1) you can get an inexpensive bike from Target, a sporting goods store, Craigslist, etc. to see how you like triathlons or (2) you can invest in a road bike from a bike shop from the start, which is far more expensive. If you are training for a sprint tri, option (1) is perfectly fine. It's only a 12-13 mile bike and you will see bikes of all kinds: real serious road bikes to beach cruisers. Anything goes. If you are training for something longer than a sprint, you will need a road bike. I invested in a road bike from the start. I was tempted to go with an inexpensive bike before making the commitment, but a friend of mine who knows me well suggested that I would be hooked on triathlons, so why not just get a great bike from the get-go. This is a great time of year to buy a bike: shops are gearing up for the Spring riding weather so they're clearing out last year's bikes. I was able to get my bike for quite a big discount this way. 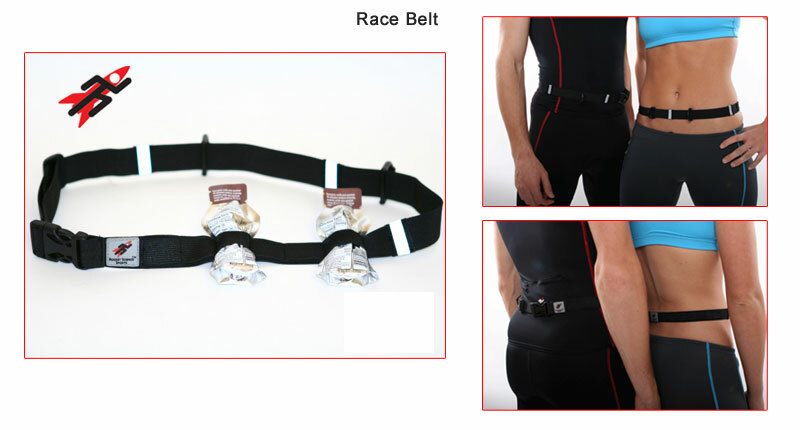 The run requires the least amount of gear: sneakers and a race belt. A race belt is what you put your number on. You do not have to wear the number during your bike, but you will have to wear it during the run. 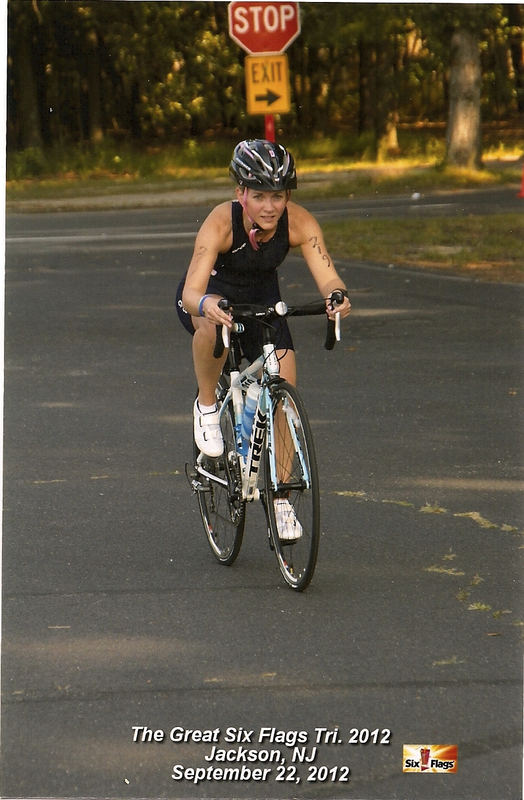 At my first triathlon, I did not have a race belt and ended up having to pin my number on my tri suit after the swim: not recommended! Obviously you cannot swim with your race number on, so you need a solution for getting it on your body after the swim. Most people use race belts, but some people pin their race numbers to a running shirt or tank and leave it in transition and put on the shirt after the bike and before the run. You can see my race belt in the picture below. I recommend putting all of your stuff on a brightly colored towel so that you can easily find your spot. When you come out of the water or back from your bike ride, you may be a little disoriented. Having a distinctive towel will help. I organize my area by zones: bike and run. I put my bike shoes with socks inside of them on the towel and then my helmet on top of that. I hide my watch under the helmet too. My run area has my sneakers, my visor and my race belt. I also keep a bottle of water, bottle of Gatorade, some energy gels and energy chews. 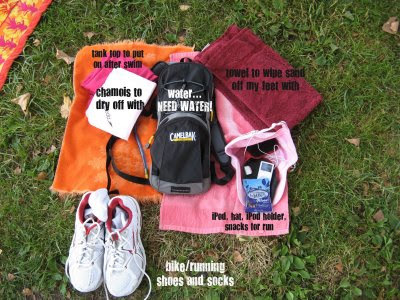 I keep a small towel too so that I can wipe off sweat or water from the swim. Some people go all out in transition and some do bare basics. Most races, thankfully, are really strict about the transition area: no one goes in without a race number. And that about does it! I hope this helps give a lay of the land of the triathlon. I am hooked on them - training for them and racing them can be so much fun because you're always switching activities. If you train properly, your body will know how to effectively compete in each event so that you're not exhausted for the next: focus on using arms and hips for the swim; quads for the bike; and other leg muscles for the run. Give it a try! If you'd like to know more, feel free to comment here or shoot me an email. Disclaimer: None of the above companies or websites mentioned have paid or otherwise comped me for mentioning them here in this post. All thoughts and opinions are my own. Further, I am not a professional and certainly not a doctor, so before you begin any running or other exercise program, please speak to a doctor first, listen to your body, know your limits. I am not an expert: this is just my compilation of tips for what works for me. So proud of you, Shan!